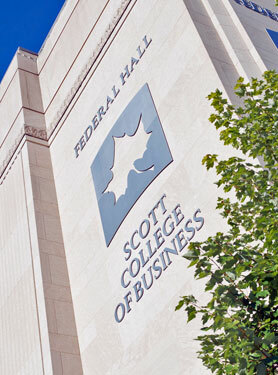 Business Education majors fulfill the same core requirements as all other College of Business majors. In addition, BE majors gain knowledge of teaching through courses and field experiences in the College of Education and the BEIT program area. Students in the BE major are given extensive preparation in using computer technology focused on meeting education and business needs. Graduates who pursue a business teaching career have the opportunity to make a positive difference in the lives of students. Full information can be found in the Business Education Major Undergraduate Catalog. Indiana State University's Academics pages includes overviews with more information on possible careers, degree maps, required courses, and outcomes. Business Education major Academics page. This minor is a relevant component for anyone whose career involves information processing and technology support services. It can be incorporated into both business and non-business majors. Full information can be found in the Information Processing Minor Undergraduate Catalog. The Professional Enhancement Program (PEP) in Information Processing Certificate is designed to provide a concentrated emphasis in information processing and automated office procedures. It is particularly appropriate for persons re-entering office occupations or updating their preparation in this area. The courses in this program are applicable toward baccalaureate program requirements. No previous knowledge of office automation concepts or equipment is needed for this Professional Enhancement Program. Full information can be found in the Professional Enhancement Undergraduate Catalog. The Indiana State University Transition to Teaching program (T2T) provides individuals who possess a bachelor's degree in business from an accredited institution of higher learning the opportunity to earn licensure certification to teach middle school and high school business courses in the state of Indiana. If you have any questions regarding these College of Business requirements, you may contact the Business Education, Information, and Technology Program Coordinator, Dr. William J. Wilhelm, at the ISU College of Business (812) 237-2076, or by email at wwilhelm.indstate.edu.